Recently, I was given the opportunity to audition for America’s Got Talent in Austin on Nov. 19, 2016. Although I had a great experience and was blessed to be given an opportunity to audition for such a popular show, I unfortunately did not make it to the judges round. I did, however, get the chance to audition here at Tarleton State University. 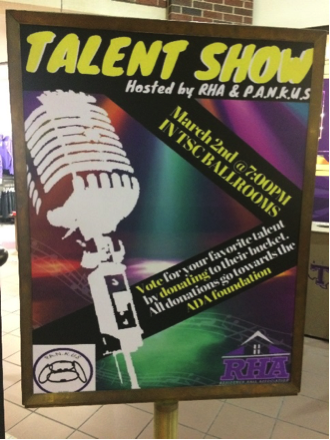 RHA (The Residence Hall Association) teamed up with P.A.N.K.U.S (People Against Not Knowing University Spirit) to host a talent show at the ballroom in The Thompson Student Center. Auditions were held over the course of three days. Several students volunteered to audition with various acts. Talents included singers, dancers, pianists, and comedy acts. I really liked the atmosphere of the auditions. Anyone who wanted to audition, could, and there also wasn’t any pressure to audition if you didn’t want to. In addition to that, everyone was very encouraging and supportive of each other. We were told that if we were going to be in the talent show, we would get a call the following Monday and the talent show would take place that next Thursday in the Ballrooms in the Barry B. Thompson Student Center. As was promised, I got a call the following Monday and was told that I was chosen to be a participant in the talent show. I loved the way the talent show was conducted. Each participant got a jar with their name on it and the audience was encouraged to put change in the performer’s jar that they felt had the most talent. The performer who had the most money in their jar at the end of the talent show, would be the winner. There were 12 acts that performed in the talent show. We all did a soundcheck an hour before the show to make sure everything was running smoothly with our performances. The talent show was a huge success. Altogether, the acts raised over $200. The proceeds from the talent show went towards the American Diabetes Association (ADA) foundation for diabetes research. I was lucky enough to win third place in the talent show as well. The prizes included a flat screen TV, an Xbox one and Beats headphones (I was awarded Beats headphones). I had a blast performing in the talent show. This event gave me the opportunity to meet a lot of different people here at Tarleton. It was such a positive experience with good vibes throughout the show. It wasn’t a huge competition. Everyone was there to have fun. I also loved how the proceeds were donated to the ADA foundation. Overall, I loved getting the opportunity to do a talent show at my own university. And, I would gladly choose Tarleton’s Talent Show over America’s Got Talent any day.